Easter crafts, kids love them! I actually quite like children's Easter crafts, myself. It's always nice to have a reason to get creative and do something special with your children. I haven't been blessed with any kids of my own, so I make Easter crafts with my nieces, nephews, and Sunday School students! This year my class will be making little Easter pins made of foam and a pin attachment. 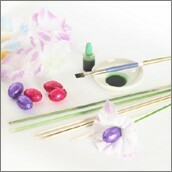 Oriental Trading Company has over 100 different Easter craft ideas for kids and adults. You are sure to find something that will suit your purposes. There are both religious and secular Easter crafts for kids and adults among their selection. Easter shaped chocolate molds are also a big hit for Easter crafts for kids. You can choose from a variety of shapes - bunnies of all sorts, Easter eggs, lambs, crosses, chicks, baskets, and more. You'll find the best prices at Candyland Crafts. Choose your chocolate and colored melts. Pick up a pack of mini paint brushes at the dollar store. Melt the chocolates. You can even use the microwave if you're careful. Just melt 30 seconds at a time, stirring after each heating. Don't overheat! Paint the details of the molds using the paint brushes and melted colors. Fill the rest of the way up with regular chocolate. Allow chocolate to set. You can pop them in the fridge to cool quicker if you are in a rush. That is one of the Easter crafts for children that everyone seems to love the best. I'll bet your kids do, too. I recently ran across a cute idea from an Aussie girl who is really great at crafts and decorating. Her name is Tara Dennis and has a website taradennis.com if you'd like to check out more of her clever creations. Paint the skewers with the food coloring. Place the individual flowers from the lei on first and top it off with a foil wrapped egg. (If the flower petals tend to slip, use a little piece of tape to hold them in place. You can also get a bit of florist foam and place it in a cute mug to use as a holder for your Easter bouquet. They'd make a pretty centerpiece on any table or even a lovely Easter gift. Well, those are a few Easter crafts for kids ideas that I think are fun, sweet, inexpensive, and clever. I hope you enjoy them. If you've got some additional ideas, please share them with us!